The better question to ask is, “What gifts do I bring to the Christ child? When we imagine bringing gifts to God, we place ourselves in the role of the wiser character of the story. But we seem to come up short when we go shopping through our souls for the perfect gift for God. “What have I to give him, poor as I am?” Or, rich as I am, I may have lots of practical resources but none seem good enough for God. I suddenly feel unworthy and that trip to Paris sounds even better where I could run away and surround my self with worldly things that make me feel better about myself. Wherever you go, there you are, though. And I’d still be at a loss of what I could possibly give to God. But we have many gifts, don’t we? The gifts God requires of us are the same gifts we have been given by God. The summer of my 8th year, my parents did a strange thing and took the family on a trip across the nation. When I look back at this I think they must have been crazy! They packed up a car with four kids (2 of whom were teenagers), 6 suitcases, 6 sleeping bags, 6 cots, a cooler, a Coleman stove and a tent all into a 1970 Oldsmobile 88 and drove all the way from Virginia to San Francisco. I mean, we must have had to stop 3 times a day just to gas up that road monster! We camped in a tent most of the way with a few hotel breaks to do laundry and enjoy air conditioning and swimming pools. We saw Yosemite, Salt Lake City, Las Vegas, the painted desert and the Golden Gate Bridge, to name a few sights on our adventure. It was the journey of a lifetime and we still tell stories from that trip. We each remember different highlights. For me it was Lake Mead and Hoover Dam. For one of my brothers, it was Disneyland. But we all agree that the most magical moment of that trip was when we stood and gazed down into the Grand Canyon. Dad snapped a picture of the rest of us gazing away from the camera. You can’t see the canyon, but you can just see the periphery of our faces full of awe. It is a favorite picture in our family. Yet, none of us has ever quite articulated how precious that moment was. Life is like this. It is a series moments when we encounter God in a way that leaves us speechless but also makes us realize the full power of God’s love. Think about those times in your life when you encountered God. There are many, I expect. There is a Celtic tradition that calls these experiences “thin places” because you experience the presence of God in a way that is like coming close to that border between this world and the next, like for a moment that border is thin, like a translucent veil you can almost see through. In the end, it was in coming home from that trip to San Francisco that gave me the earliest realization of who we were as a family, as individuals, as plain folk full of potential, called into God’s world as servants. That Grand Canyon moment may have been a thin place, but the best part of the journey was coming home. For, as the saying goes, it is in coming back home that we learn who we are. We are celebrating the feast of the Epiphany today. I have transferred this feast from yesterday because this is the name of our parish. This is good. We should spend more time coming to understand the name under which we do ministry in the world and what that means to us. I am convinced we must first know who we are if we are to follow Christ. And so the themes of this sermon are about identity as well as coming to better understand the stories and meaning of the season of Epiphany. And we have another 5 Sundays in this Season between Christmas and Lent in which to examine that. Our opening collect today briefly outlines this theme. It says to God, “by the leading of a star you manifested your only Son to the peoples of the earth.” Manifestation is the meaning of the Feast of the Epiphany. God has become one of us. Take a moment - or maybe 6 Sundays - to let that sink in! And then the collect turns to God and asks of God to lead us thusly, through our faith to the very presence of God. In other words, God, lead us back to you by reminding us of your love for us through these many epiphanies. The word Epiphany itself, at root means sudden revelation or insight. I told the students in the school in chapel the other day about that old advertisement for V8 tomato juice. We all had fun for a second smacking our foreheads and saying, “I could have had a V8!” That’s what we do when we have moments of revelation. We say “Wow!” and we smack ourselves out of the sheer joy of it. When I put away my one Christmas decoration yesterday I had an Epiphany moment. This one decoration was a fake wreathe that had been hanging on a Santa door hanger on the glass storm door at the rectory for the past month. It was a weak effort to keep up with all the reveling and I was a bit tired of it but I was determined not to bring it down until Epiphany, in good Episcopalian style. Removing it let all sorts of sunlight beam in through the glass storm door into the foyer. I sat and basqued in this mid-winter glow for a moment. Last night at dinner, some of us were talking about amazing experiences we have had. It makes for good dinner conversations to tell such stories. Someone told a story about a powerful experience when visiting a Roman church. Several folks told claims to fame stories about encountering celebrities. I told about a car accident I once had in which I seemed to escape great injury miraculously. This is life - a series of experiences some of which are memorable, some of which are life changing. Meeting a celebrity or visiting one of the wonders of the earth can be rememberable but epiphanies that bring us new revelation about God and God’s call for our lives tend to be a bit more surprising and life altering than just those things that entertain us. Standing with my family at the edge of the Grand Canyon was life altering because we were so tuned into our relationships with each other. Still, the epiphany of this didn’t come until we got home and told the story. And kept telling it. Like the wise men, these experiences sometimes take long journeys either real or metaphorical. It seems we sometimes need to traverse for a while before we encounter God. And it’s never like a treasure hunt in which an X on our map tells us just where to dig. No, God’s way is to guide us with God’s light and then send us home by another way. 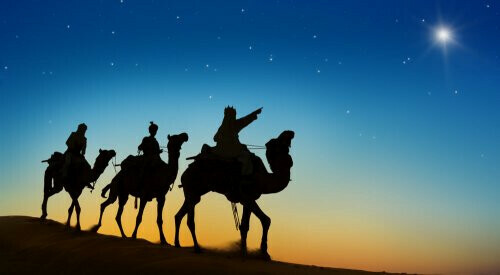 The magi followed the light of a star to visit the King of Kings and they gave him gifts. One gift was gold which was a very practical gift, one which would be needed when Joseph answered the dream from the Angel about rushing away from where they were because Herod was planning to kill all the boy babies of a certain age. Mary and Joseph needed to move quickly to save his life, so the gold would come in extremely handy until Joseph could find work and earn a living for his small family. The frankincense was a key component of the incense used in rituals as both a purification symbol and as a symbol of prayer rising to the heavens with the smoke. It was a symbol of sanctity and, probably, a recognition of the sanctity of this child to whom this this gift was presented. Myrrh was a stranger gift because it was traditionally used in the preparation of a dead body for burial. It offered a form of preservation, but also a cleansing and help to disguise some of the less favorable scents that accompany death. It is usually accepted that this gift was a foretelling of Jesus’s death, a rather strange gift for a new a young child, but perhaps not. When we tell this story, we tend to imagine receiving such gifts of gold, incense and essential oils and we ponder what we might do with these pretty things that smell good and would get us to Egypt - or maybe Paris. I’d rather go there. I could spend the gold on some pretty clothes and maybe trade the smellies for better par fume or at a great French restaurant! You see how quickly I did that? How quickly we think of exchanges that mean more to us than the original gift, how quickly we see ourselves as the recipient worthy of such gifts or even better gifts. How quickly we turn to receiver over and above giver. The better question to ask is, “What gifts do I bring to the Christ child? When we imagine bringing gifts to God, we place ourselves in the role of the wiser character of the story. But we seem to come up short when we go shopping through our souls for the perfect gift for God. “What have I to give him, poor as I am?” Or, rich as I am, I may have lots of practical resources but none seem good enough for God. I suddenly feel unworthy and that trip to Paris sounds even better where I could run away and surround my self with worldly things that make me feel better about myself. Wherever you go, there you are, though. And I’d still be at a loss of what I could possibly give to God. But we have many gifts, don’t we? The gifts God requires of us are the same gifts we have been given by God. There are some who have the gift of hospitality, and a wonderful gift that is, whether it is extending hospitality from their home, or their church, or in the civic groups to which they belong. The gift of hospitality often gives them the opportunity to show the teachings of Jesus rather than simply preaching them. Some might offer the gift of education, not only teaching spiritual values, but also human values that teach that all people are deserving of respect and, if not love, at least respect for their being children of God every bit as much as we ourselves are. There is the gift of service, of sanctity, of constancy, and parts of ourselves that would make this world more of the kingdom place than we can currently claim. It takes staying tuned to the thin places and epiphanies in life to know what your gift is and how and when to give it back to God. And so I come back to identity, to the head smacking moments in life when we realize not just who God is, not just how great God’s love is for us, but who we are in relation to God and to each other. What gift have I received? What gift can I give? These questions have everything to say about our reflection on who we are as followers of this Christ child. So, if you want to seek the epiphanies of God, if you want to resolve to be a better person this year by seeking God, you might do better to put down your map and your shovel and simply follow the light. As if following a star on the horizon, simply follow the light that is in your own heart. And then, in coming home you will know what gift to give, to and in honor of, the Christ child. Beware, however that you may end up going home by another way.